We’d love your help. Let us know what’s wrong with this preview of Love at Fourteen, Vol. 6 by Fuka Mizutani. To ask other readers questions about Love at Fourteen, Vol. 6, please sign up. I need an anime for this now. I also have to say that I really appreciate that this manga doesn't treat a lesbian as "just a phase" or something that needs to be fixed. Well, it might have been implied in the Japanese version, but in the English text, all the nurse says is, "It's okay. It's not strange. And it's not an illness. It's not something... you need to be cured of." So, yay normalization. Some might be confused why I'm bringing this up, but think of it this way. If American media as a whole is finally getting on the bandwagon with LGBT representation, a lot of anime and manga (excepting specific genres devoted to LGBT) are still pretending the bandwagon doesn't exist. They're getting better about it, but I still run into a lot of manga that has girl-crushes represented as a phase or just for laughs, so I'm happy when I find things like this. Now for the things that bothers me. I'm starting to get a little concerned about the teacher-student relationship. There are events in this volume that make me question whether Hinohara-sensei's feelings are verging on the inappropriate. And now it seems there's a possibility of another adult-middle schooler relationship, and it too is making a warning flag raise. Lastly, there's a student who is kind of creeping on his teacher while she's at school with binoculars, and that has me more concerned than the other issues I have. This review has been hidden because it contains spoilers. To view it, click here. I might update this later with a review link, but I was really squicked out/disturbed by this volume. I seriously wish the mangaka would back off on depicting Hinohara-sensei's "romantic relationship" with Nagai. He's an actual child, and whenever their "relationship" is shown on the page I feel disturbed and kind of sickened. Anyone who's been groomed for abuse would recognize instantly what she's doing to him, especially in this most recent volume. It's especially upsetting because it's serious I might update this later with a review link, but I was really squicked out/disturbed by this volume. I seriously wish the mangaka would back off on depicting Hinohara-sensei's "romantic relationship" with Nagai. He's an actual child, and whenever their "relationship" is shown on the page I feel disturbed and kind of sickened. Anyone who's been groomed for abuse would recognize instantly what she's doing to him, especially in this most recent volume. 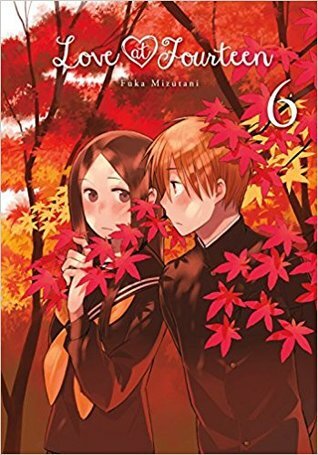 This cute little tale of gentle romance and teenage crushes would be one of my favorite manga series if it weren't for the ongoing B-plot about the inappropriate relationship between the adult female teacher and the teenage male student. If not for that element I'd probably be giving this four stars, especially for the scene in which a young LGBTQ character has a moment of revelation. I am overwhelmed by the innocent, sweet, cuteness of this story. I feel like it's unique enough to stay interesting and make you want to keep reading, but derivative enough to feel like other shojo/josei. The multiple teacher/adult and student almost-relationships really weirds me out though. Perhaps Japan doesn't have as much of an underage taboo? So the storyline with the main characters is super cute, but I'm a bit creeped out by all the adult/minor relationships. There's nothing explicit, but it's very obvious that things are going on. It's just kind of weird. Hinohara is creepy and if I thought the mangaka knew that, it would be a very interesting look at someone who is damaged and damaging -- but I can't help feeling that Mizutani-sensei doesn't really see that. Still, I love the manga, and the lesbian positivity made me so, so happy. I think the light-hearted, sweet moments with the two main leads are where the series shines, but I still can't say much for the rest of the series. I'm going to stop there because I'll rehash everything I've already said about the previous volumes. The problems I have had with the series since volume one still stand, but honestly this was too cute to not give five stars. I just love the simple, sweet little moments in this manga that perfectly describe what love at fourteen is like. Another good volume. This series is kind of cute. And I love the art style. This one was also really good. First off, look at that cover art. This is gorgeous, and really, I could recommend this series for the art alone. That said, it's also great fun seeing all the goings-on during their school trip in this volume, and then the festival afterwards. Also, the school nurse is my new favorite background character; I don't know that we even know her name yet, but she really stole all of her scenes in this volume -- I really hope we continue to get her sass and wisdom going forward.